This is the Danish edition, published by KLIM, of The Ghostway, the sixth book in Tony Hillerman's Navajo Mystery Series and the third novel featuring the protagonist Sergeant Jim Chee of the Navajo Tribal Police. The text was translated by Søren K. Barsøe and the cover art was created by Nils-Ole Lund. Binding: Paper covers. 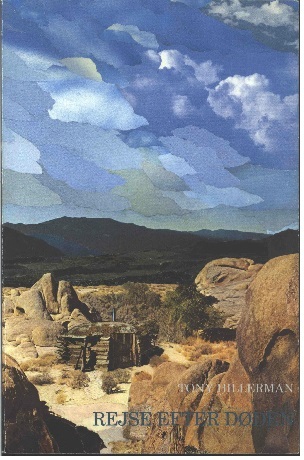 The cover art, designed by Nils-Ole Lund, pictures a hogan surrounded by sandstone outcroppings. The spine is blue with the title printed in light blue and author's name and publisher in light pink print. The front and back cover contain fold out sections that provides information about the author and short summaries of two other Hillerman novels, People of Darkness and The Dark Wind.